Picasso was exceptionally prolific throughout his long lifetime. The total number of artworks he produced has been estimated at 50,000, comprising 1,885 paintings; 1,228 sculptures; 2,880 ceramics, roughly 12,000 drawings, many thousands of prints, and numerous tapestries and rugs. The medium in which Picasso made his most important contribution was painting. In his paintings, Picasso used color as an expressive element, but relied on drawing rather than subtleties of color to create form and space. He sometimes added sand to his paint to vary its texture. 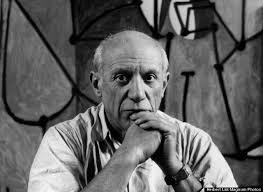 A nanoprobe of Picasso’s The Red Armchair (1931) by physicists at Argonne National Laboratory in 2012 confirmed art historians’ belief that Picasso used common house paint in many of his paintings. Much of his painting was done at night by artificial light.